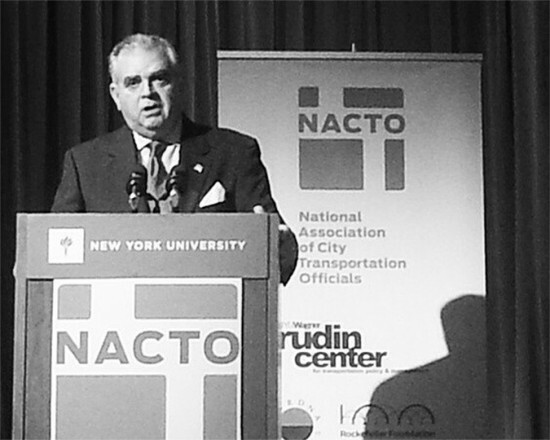 After a rousing opening speech from NYC Transportation Commissioner Janette Sadik-Khan, Transportation Secretary Ray LaHood took the stage at the “Designing Cities” conference of the National Association of City Transportation Officials yesterday. Streetsblog stringer Dani Simons was there and briefed us on the highlights. We’ve made amazing progress in cities in the past four years with light rail, high-speed rail, BRT, walking and biking paths. And we’re not going back. We can only go forward from here. The incubators (of good transportation ideas) in America are the cities. I know a lot of you were disappointed about the new federal transportation bill, MAP-21, but you know the best thing about the new bill? It’s only a two-year bill. In my opinion the fight over the next bill won’t be as much about content as it is about how to fund it. And I think, if Obama is reelected, that Congress will start getting to work on the new bill starting in January. Hopefully Congress will pass new appropriations to fund another round of TIGER grants, but that depends on whether Congress passes any new appropriations before the end of this term. Indeed, there are stirrings of work on the next bill already. LaHood is right: The fight next time will be all about money, just as the fight last time was all about money — it was just never resolved. If Congress can’t find a way to bring in as much in revenue as the Highway Trust Fund needs to spend on infrastructure, the country will continue along a path of belt-tightening and bailouts — and it will strengthen the hand of anyone who wants to eliminate funding for transit, walking and biking. Without overcoming the funding issue first, it will be difficult to make significant progress in the new bill. As for appropriations, the House has passed half of its appropriations bills for fiscal year 2013, which has already started, including the one for transportation. The full Senate has passed none, though the Senate committee for transportation appropriations did pass one that includes money for TIGER, as well as the Partnership for Sustainable Communities grants and non-high-speed inter-city passenger rail. The House budget doesn’t allocate money for any of those things. A continuing budget resolution is in place now, which freezes current funding through the end of March, including for TIGER.